So with the new year upon us everyone is trying to be healthier. People are trying to eat a little healthier and exercise more to lose some of those extra holiday pounds. I too, every January, jump on the healthy lifestyle bandwagon (hopefully I can keep it up for the rest of the year)! 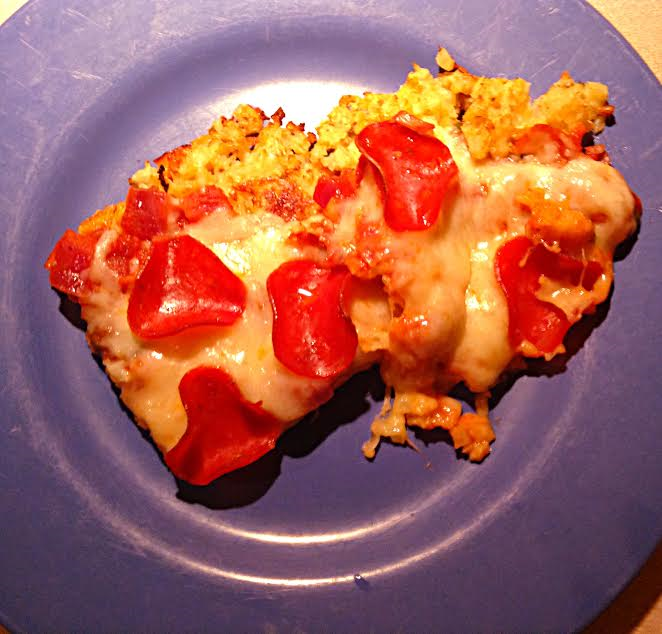 The cauliflower is already chopped and the recipe was on the back for the pizza crust. I followed the recipe exactly. 2. 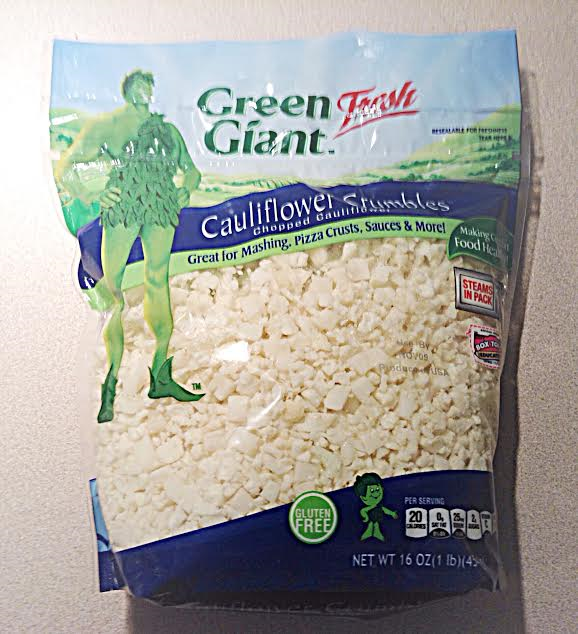 Steam cauliflower as per package directions. 3. Line large baking sheet with paper towels. Place cooked Cauliflower on baking sheet and let cool 10 minutes. 4. Return Cauliflower to a large bowl. Add the remaining ingredients to the cooled Cauliflower. Stir well to combine. The mixture should come together to form a loose dough ball. 5. Place mixture onto parchment paper; pat into a 10” circle. Place parchment paper with Cauliflower crust onto wire cooling rack. Place rack in oven. Bake 15-17 minutes or until lightly browned. Remove from oven; cool 10 minutes before topping. 6. Carefully flip cooled pizza crust over onto cookie sheet. Remove parchment paper. 7. Add your favorite pizza toppings; bake 6-10 minutes at 425°F or until toppings are hot and cheese is melted. I was actually impressed with the taste of the crust. I honestly wasn’t expecting to like it, but the crust was flavorful with all the different seasonings. However, the texture was definitely different from pizza crust, it wasn’t crunchy, and it was very difficulty to hold in your hands. Every time I picked it off my plate it fell apart. It was easier to eat with a fork. That was the only bad thing about it, the overall taste was good and it definitely was a healthier version for all those pizza lovers out there, but I felt like I wasn’t eating pizza. I don’t want to eat pizza with a fork; I want to hold it in my hands! On a side note, my husband loved it! There’s a ton of different recipes out there using cauliflower in different ways. I also want to try mashed cauliflower (a spin off of mashed potatoes). Please feel free to share below some good mashed cauliflower recipes. Also, I’ve been interested in getting a Spiralizer; any thoughts?